Hey coffee lovers!! Got something very special for you, will be available for free and will help you to install an instant station for convenient coffee preparations! 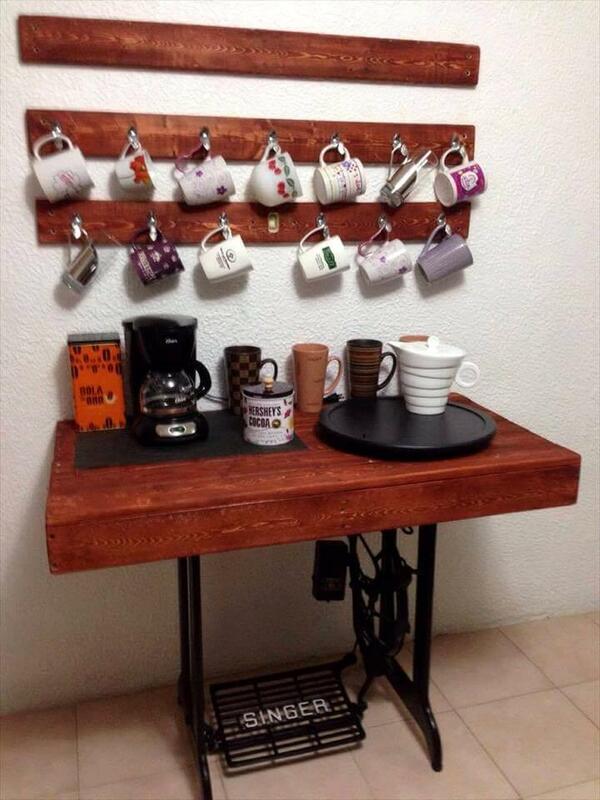 Some metal hooks, pallet wood and old metallic sewing machine base have been used as the basic supplies to craft this DIY pallet and old sewing machine base coffee station which is something highly valuable for tea and coffee lovers! 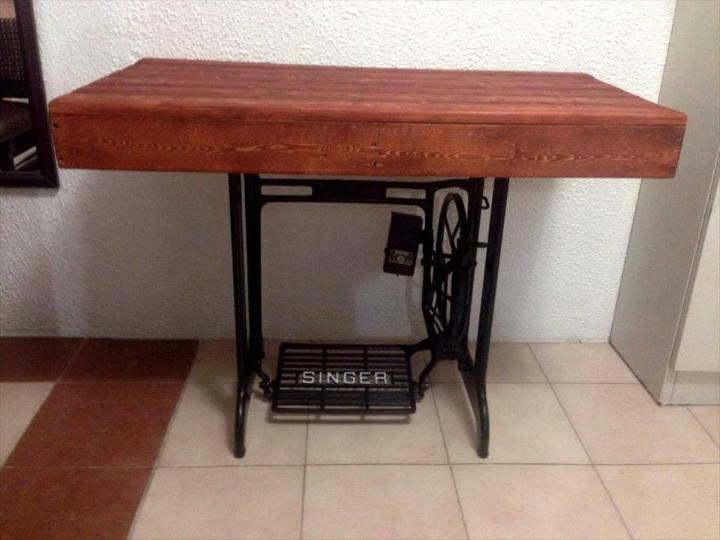 Here old metal sewing machine base have been modified a little and has been given a new top made of pallet slats, this creates a perfect table with metal base which is to use for preparations of coffees and teas! 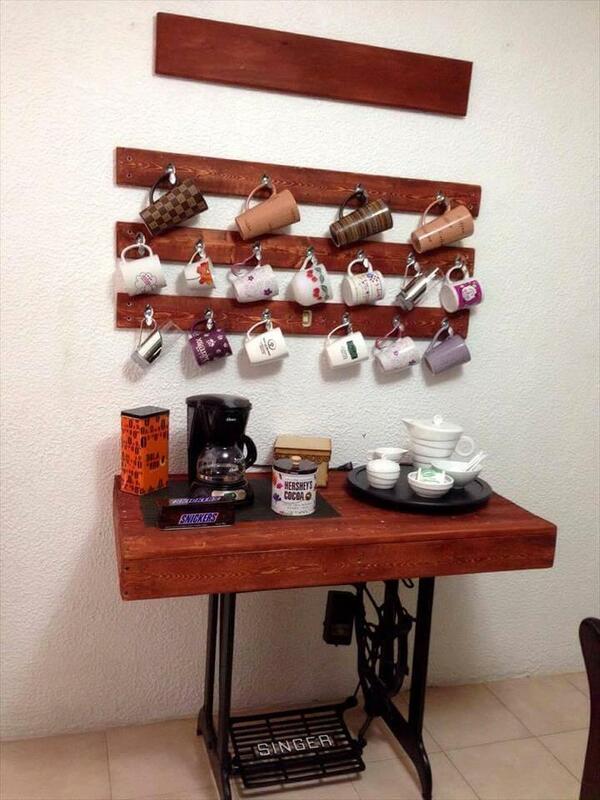 To hang plenty of mugs or coffee cups, a coffee mug rack has been built using straight planks of pallets and has been mounted on the wall behind the table! 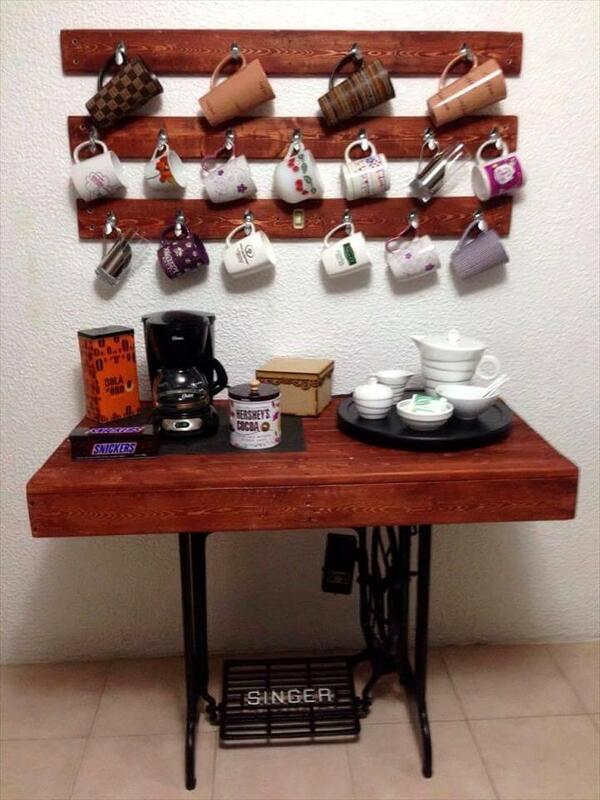 Metal hooks come with mannered assortment so cause a stylish hanging of coffee mugs! It all depends on your finishing plan that whether this coffee station will look modern or rustic! Here first of all the slats of pallets have been used to turn a old sewing machine base into a coffee station, having shape like a beautiful table! You can go for some dry arrangements to figure out the right measurements that will let you to do better fittings for sure! 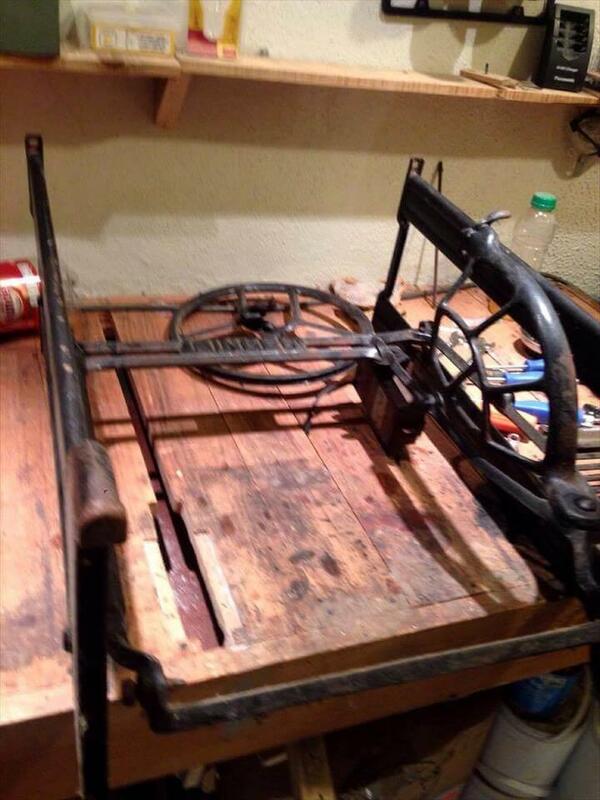 Here the metal sewing machine base has been readjusted a little! 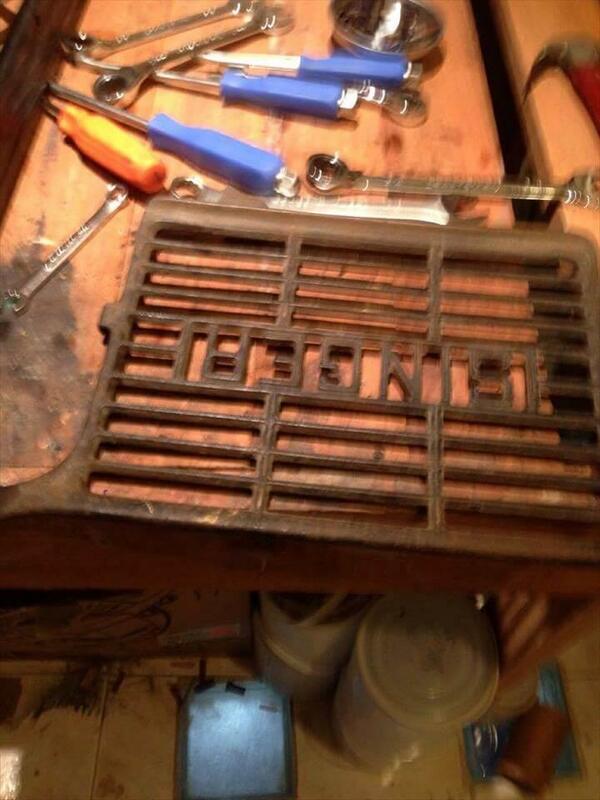 Make the lose nuts tights if find any in the metallic base and just make it ready to receive a new wooden top over it! After you finish the metallic sewing machine base with a new tabletop, it will look like this, will provide a sturdy wooden surface on a waist height to prepare your coffees!